It’s time to remind everyone that irrigation systems need to be cut way back or cut off completely. 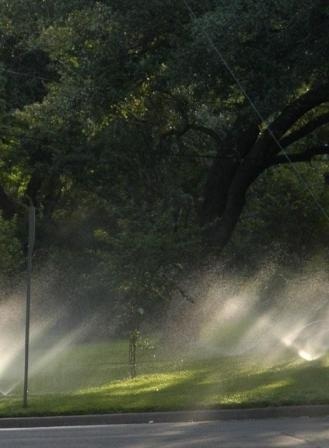 Several of my listeners and readers admit that they are still watering with the same schedule used in the summer. It’s easy to leave the controller on automatic and worry about other things. Not only is that a huge waste of water, but the soil is being damaged, plant roots are being injured and one more problem – mosquitoes are being given a perfect environment! How often should you be watering now? It depends on your location, the soil, plant types, organic or synthetic program, etc. If you are organic, you’ll have lower water needs. Best plan? Turn the irrigation controller to manual. Then it won’t come on unless you push the button. You’ll save lots of water and your landscaping will look better. Proper watering techniques will result in water savings and reduce disease, insect and weed infestations. One application of water every 5 – 7 days is adequate during the Summer. Sandy soils may require a little more frequency. During the winter, no water is required if your soil is frozen and once every other week in the South. You can over water a lawn, so allow the soil to dry out between waterings. This encourages the plants to grow roots deeper into the soil, making them healthier and more drought tolerant. Wait for the lawn to tell you it needs water. Foot prints and lawnmower tracks that do not bounce back are signs that your lawn needs water. When the grass is dormant, you can apply as little as 1 inch of water each month. This amount of water will help keep the lawn alive, but it will not stimulate the lawn to break dormancy. Again, it's best just to keep the system on manual and run it when the plants appear to need water. You should also do hand watering as needed. That's what I do. To discuss this newsletter or any other topic, tune in 8am -11am CST to the Dirt Doctor Radio Show. The phone number is 1-866-444-3478. Listen on the internet or click here to find a station in your area. Organic Club of America Members can log in on Sunday mornings to see the Dirt Doctor's Live Broadcast. Register for Howard Garrett's Healthy Living and Growing Seminar.